Built 1893-1894 for Henry M. Field, the commercial and residential complex covers half a block. 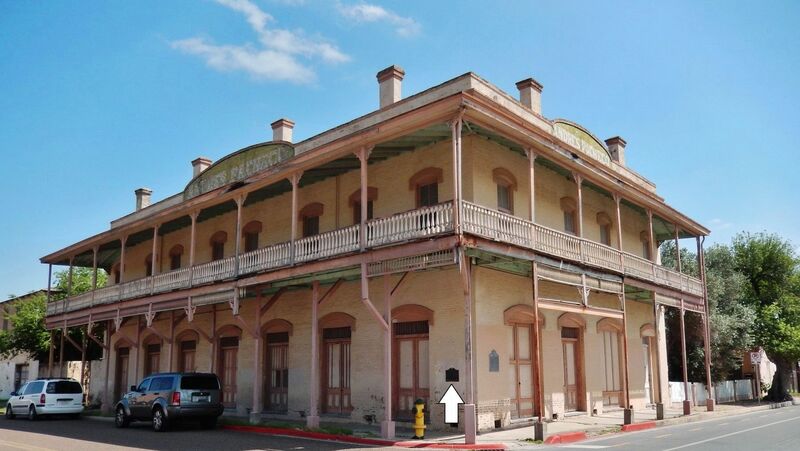 The two-story gallery, spindle cornice and railings indicate that the building is a mix of Border Brick style and French Creole architecture. The complex includes former servants’ quarters, a carriage house and an upholstery shop. In 1919 Andres Pacheco purchased the building for his hide and wholesale farm tool distribution business. 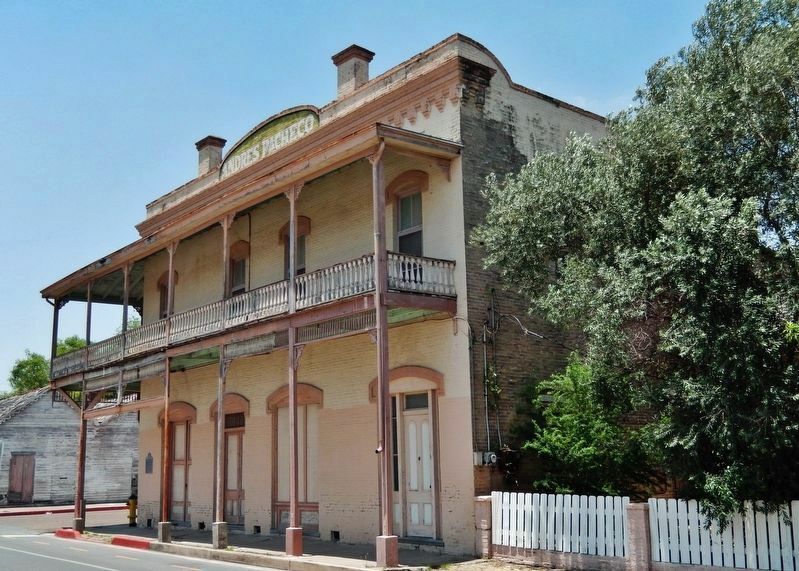 Construido 1893-1894 para Henry M. Field, el complejo residencial y comercial abarca media cuadra. La galería de dos pisos, los husillos en los barandales y la cornisa indican una mezcla del estilo de ladrillo regional y arquitectura criolla francesa. Los cuartos de sirvientes, la cochera y la tienda del tapicería son parte del complejo. En 1919, Andrés Pacheco compró el edificio y lo usó para su negocio de distribución al mayoreo de herramientas agrícolas. Erected by Brownsville Historical Association. 29.722′ W. Marker is in Brownsville, Texas, in Cameron County. Marker is at the intersection of East Monroe Street and East 11th Street, on the left when traveling south on East Monroe Street. Touch for map. Marker is mounted at eye-level, directly on the subject building, at the southwest corner, facing East Monroe Street. Marker is at or near this postal address: 1049 East Monroe Street, Brownsville TX 78520, United States of America. Touch for directions. Other nearby markers. At least 8 other markers are within walking distance of this marker. Field-Pacheco Complex (here, next to this marker); Campo Santo Viejo (within shouting distance of this marker); 1912 Cameron County Courthouse (within shouting distance of this marker); Cameron County (within shouting distance of this marker); La Madrileña (about 400 feet away, measured in a direct line); Old Cameron County Courthouse/Dancy Building (about 500 feet away); a different marker also named La Madrileña (about 500 feet away); a different marker also named La Madrileña (about 500 feet away). Touch for a list and map of all markers in Brownsville. Regarding Field/Pacheco Complex. Marker is in the Brownsville Historical Trail series. More. 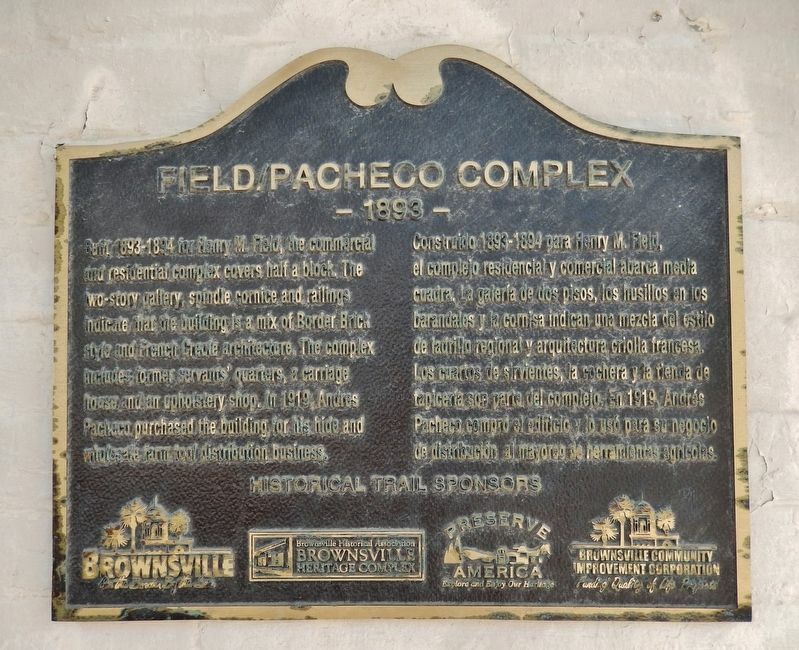 Search the internet for Field/Pacheco Complex. Credits. This page was last revised on March 18, 2019. This page originally submitted on March 17, 2019, by Cosmos Mariner of Cape Canaveral, Florida. This page has been viewed 58 times since then. Photos: 1, 2, 3. submitted on March 18, 2019, by Cosmos Mariner of Cape Canaveral, Florida.